The lesson I learned last night is just that. Don't blink. Not for one second. I foolishly gave up last night. I packed it in. I turned off the game and went to sleep. Around 12:30 the Penguins gave up two goals in 17 seconds to trail in the third period. It was time to go to bed. 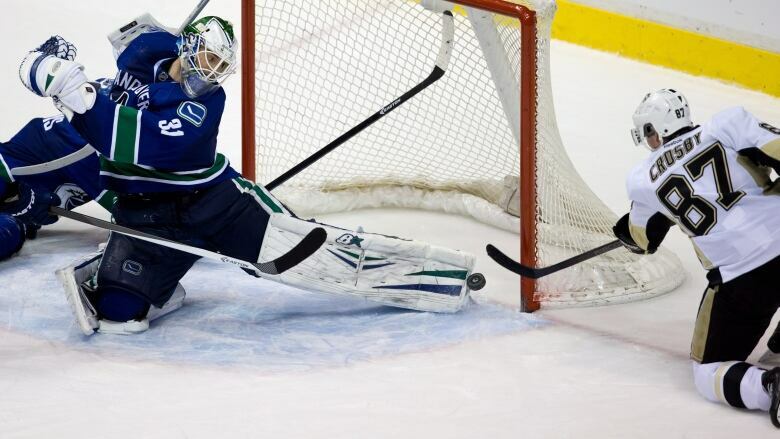 They'd looked sluggish, Sidney Crosby looked hobbled, it had been a tough game defensively against a good Canucks team. I awoke at 1:45 to see texts, "Are you watching this? WOW!" I saw the ESPN alerts: Penguins scored again. And won in a shoot out. Kris Letang played one of his best games. Sidney Crosby rebounded with a great goal. Off of his injured foot. The defense kept it close in regulation and OT. Fleury shut the door in the shoot out. Sid ended the comeback and ended the game. Dan Bylsma became the Penguins all time leader in coaching wins. The Penguins did not give up when I did. As a result I missed 16 seconds of unbelievable magic. Magic that with a cast of characters like Letang, Fleury, Malkin, Crosby, Neal, Jokinen, Kunitz is always possible. Don't ever give up on a game and in the words of The Doctor: Don't blink. Don't even blink.